This program, which George developed while beginning to learn the Java language, is packed with technical features detailed in the next section. We converted the code to Oxygene for Java and made a few changes. The user interface is neatly constructed, as shown by these screenshots. We hope that banks will not get any ideas from George's penalty for entering the wrong password three times! Students intending to write a similar application should think of a more realistic outcome. You could also (1) encrypt passwords for storage and (2) store a list of passwords used by each customer in order to prohibit their re-use. 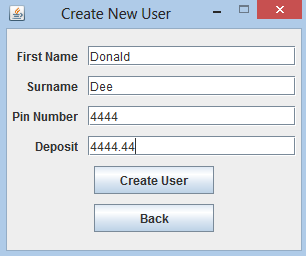 It would also be desirable to be able to delete a user other than by editing the CSV file. use of inbuilt routines including charAt, format, length, substring, toCharArray (String), toString (Integer), parseDouble (Double) add, subtract, toString (BigInteger), sort (Collections), dispose, getContentPane, setDefaultCloseOperation, setTitle, setSize, setResizable, setLocation, setAlwaysOnTop, addWindowListener (JFrame), addActionListener (JButton), addItem (JCombobox), equals (Object), getSource (ActionEvent), getText (JTextComponent) and hasNext (Scanner). frame.addWindowListener(new interface WindowListener(windowClosing := @windowClosing));. 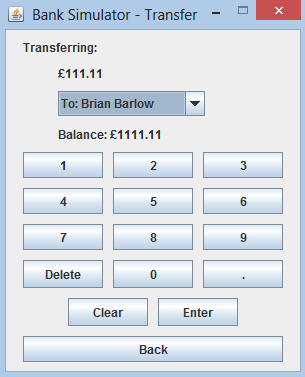 See the contents below of the Accounts.csv file that we used to test the application. 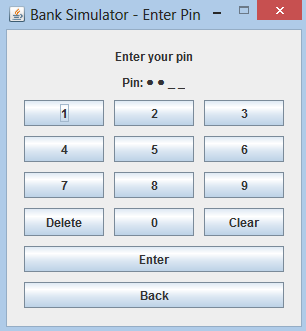 It is placed in a folder named csv within the folder that contains the executable file BankSimulator.jar. The Accounts.csv file must not end with a blank line. Follow the numbered links below to see the Oxygene for Java code.